It’s cheap enough, but you get what you pay for. Motion sensors are an essential component of any home security system. But in Kangaroo’s current ecosystem, motion sensors are the only component. On the upside, that means you don’t need a central hub, because the sensors connect directly to your Wi-Fi network. What’s more, a single motion sensor can cover an entire room, saving you from the expense of installing door/window sensors on every door and window leading into the room. On the downside, you won’t be notified of intruders in your home until they’re already in your home. And you get no protection at all when you’re at home. You’ll need to install an app on your smartphone (Android and iOS are supported) to receive messages from the sensors, and you can invite third parties—such as a neighbor—to help you monitor your home by typing their mobile phone numbers into the app. Kangaroo will send them an invitation, and they will also need to install the app (you should of course ask them if they’re willing to do this for you ahead of time). You’ll arm and disarm the sensors from the app’s home screen. You’ll also see notifications here. 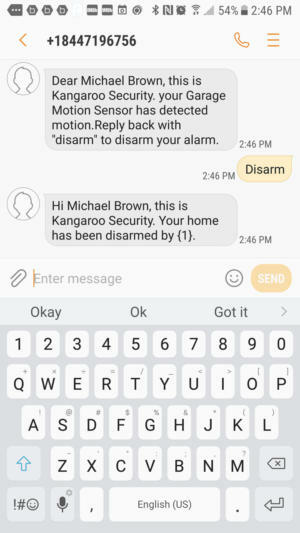 Under the free self-monitoring plan, Kangaroo will send push notifications to the app on your phone and to whoever has accepted your invitation to help. A paid subscription—$9 per month or $60 per year—unlocks a host of additional features, including professional monitoring service (more on that in a bit). Professionally monitored security systems generally qualify you for a discount on your homeowners’ insurance, and Kangaroo says it will help you obtain that from your insurance provider. The last benefit included with the subscription plan is Amazon Alexa integration (Google Assistant and IFTTT integration are in the works). Kangaroo’s motion sensors are relatively compact devices (3.55 x 1.55 x 0.7 inches) that operate on two AA batteries (included). They come with two-way adhesive pads on the back for peel-and-stick installation. I’ve never encountered an adhesive that lasted for very long, and the motion sensor I installed in my garage fell off after just a month of summer heat (Kangaroo rates them for indoor use only, but I don’t consider the garage to be outdoors). That said, the unit I installed inside the house remained mounted until I took it down at the end of my review. Kangaroo helpfully provides two wood screws for a more secure installation, but there’s only one predrilled hole on the detachable back that faces the wall. I would recommend drilling one above that to prevent the top-heavy sensor from pivoting down. Actually, Kangaroo suggests mounting its motion detectors vertically, with the sensor at the bottom. But if you have pets, it recommends mounting them with the sensor at the top to avoid false alarms (the company says the motion detector will ignore moving objects up to 2-feet, 4-inches high). The sensor itself detects motion up to 15 feet away, with a 120-degree field of view. During installation, you name each sensor according to the room it’s installed in, and you provide your street address and phone number via the app. A supplemental field in the home address section labeled “Notes for authorities” allows you to provide information they might find helpful when they respond to a call. I entered the code for my electric gate in this field. Kangaroo suggests other scenarios, too, such as if there is an elderly or disabled person in the home, or if there’s a key under the welcome mat. If you miss the text message the subscription service sends when a sensor detects motion, you’ll get a phone call from a live human. The system is ready to use as soon as you have your sensors installed and registered in the app. To arm the system, swipe right on the app’s home screen. This will initiate a 10-minute countdown to allow you to leave your home without setting off the motion detectors. There is currently no way to eliminate this countdown should you choose to activate the sensors after you’ve already closed the door behind you. Since Kangaroo doesn’t have any other type of sensors, there’s no “home” and “away” mode. “Away” mode is all you get. You wouldn’t want the motion sensors active while you’re at home, unless they’re installed in rooms you don’t routinely go into (the garage, maybe?). I suppose you could discipline yourself to remember to disarm the sensors when you do go in those rooms, but that’s just not very realistic. As it exists today, this security system can only protect your home while you’re gone. When a sensor is tripped, you’re notified via push notification to the app on the free plan, where a “call 911” button is displayed. With the subscription plan, you’ll get a push notification and/or a text message. Subscribers also get a robocall. In all cases, you can slide a button to disarm the system if you decide it’s a false alarm. If you’re a subscriber and don’t take any action, a representative will call you to ask if everything is OK. If you don’t respond to that call, the monitoring service will notify the police. As I mentioned earlier, Alexa integration (and Google Assistant, at some point) is included with a paid subscription, and IFTTT integration is in the works. But that’s as far as Kangaroo goes. 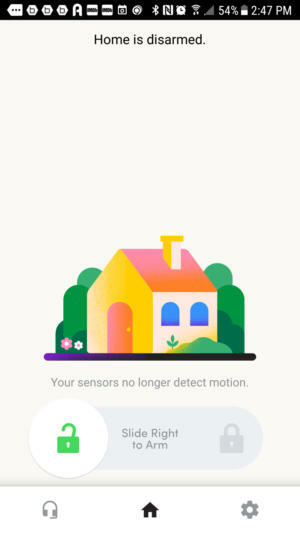 You can’t integrate with SmartThings or any of the other product or service, and that includes sirens, door/window sensors, and security cameras. Kangaroo is working on the new products for the first two categories, but not the third. Sirens can be helpful because they draw attention to your home—something no intruder wants. Personally, I like to have the loudest siren I can get, in the hope the noise will drive the intruder out. The absence of door/window sensors means you might unknowingly leave one or more of them open when you leave, giving an intruder an easy access point. But the absence of security camera support is this system’s biggest shortcoming: Considering that the police departments in many jurisdictions issue fines for false alarms, how confident will you feel calling 911 based solely on a motion sensor being triggered? 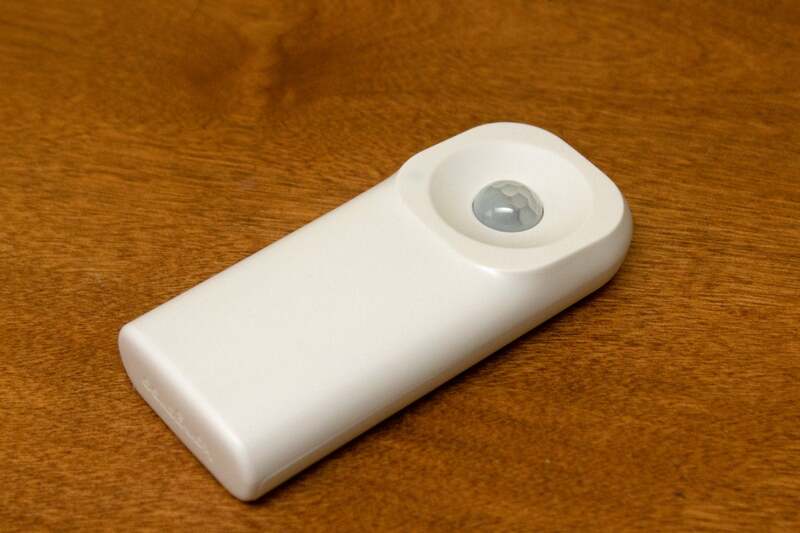 Kangaroo Motion Sensors have a 120-degree field of view and 15-foot range. You could install third-party security cameras in the rooms where the motion detectors are installed, but you’d need to launch a separate app to access those feeds, hoping to see whatever set off the alarm. But there’s no guarantee the camera’s motion sensor will be tripped by the same event that set off the motion detector. A more robust and better integrated security system will trigger all your security cameras to record, giving you the best chance of seeing what’s going on and what happened. 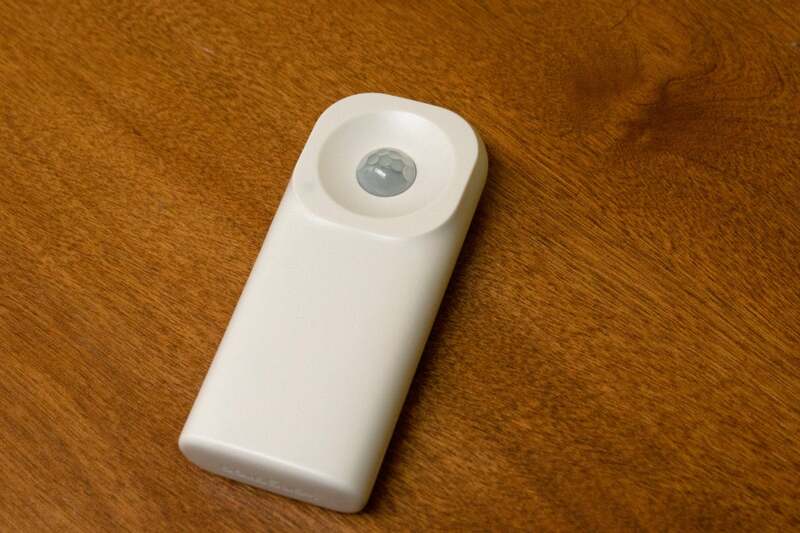 Cash-strapped homeowners might consider a $30 self-monitored motion sensor to be a good deal, and the subscription fee for professional monitoring is the cheapest I’ve seen. But this system’s biggest limitation is that it offers virtually no security while you’re in your home, and the professional monitoring plans for some complete DIY home security systems don’t cost much more than Kangaroo is charging. A $199 Ring Alarm kit, for example, includes one motion sensor, one door/window sensor, a siren, and more, and it can be integrated with Ring’s video doorbells and indoor/outdoor security cameras. Ring’s optional professional monitoring option costs $10 per month, and that includes cellular radio backup if you lose your broadband connection, plus cloud storage for an unlimited number of Ring cameras. Kangaroo has several other weaknesses as well. The app doesn’t maintain an event log, so any history of motion detection is erased as soon as you clear your smartphone notifications. And there’s no geofencing feature, so you’ll need to remember to arm the system each time you leave and disarm it every time you return. 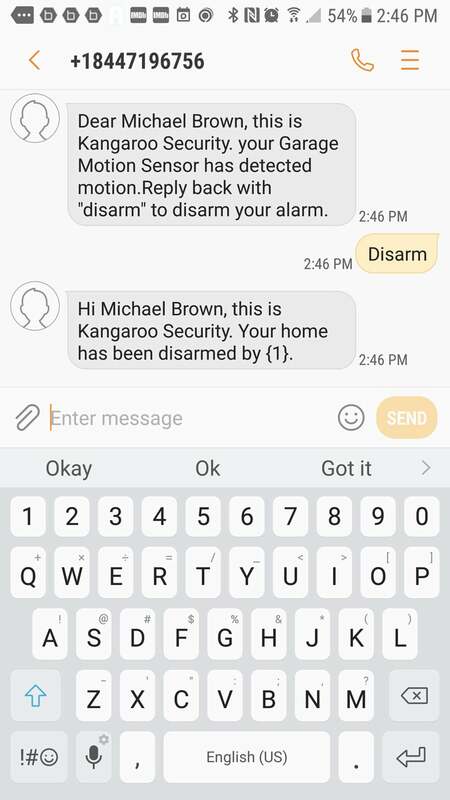 Bottom line: Kangaroo is a cheap home security system, but it doesn’t offer a whole lot of value. Kangaroo presents a very low barrier to entry when it comes to home security, but it’s extremely feature limited and it only protects your home while you’re not in it.